Here is the dish I love the most! Having grown up in a lovely little town in Central Kerala, this has been my favourite ever since childhood days. 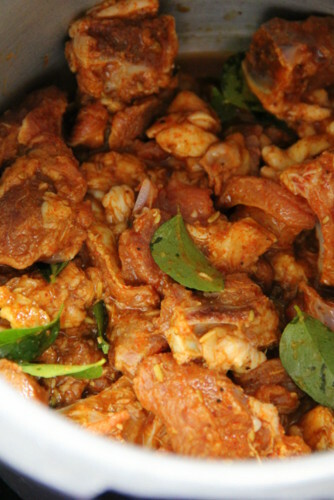 Erachi ularthiyathu is a signature dish of Christians (not sure whether this belongs to the Catholic/Syrian/Jacobite community) and as far as I know, every family make the similar way! 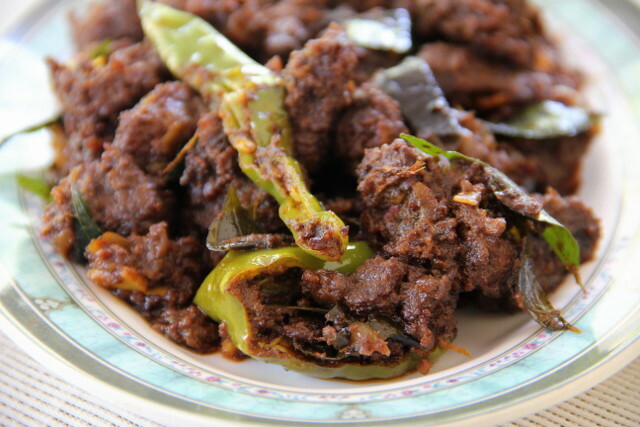 They use beef commonly to make the dish and 'beef olathiyathu' had been an accompaniment which my friends shared heartily with me during lunch time, back school and college days! Beef is still a taboo back home in my mom's house. She never cooked beef or sausages though brother and me loved them! We continued to savour the dish which our friends brought along for their lunch with kuthari choru and had to our heart's content. The families cooked the dish hot and fresh when we visited them and made us happier! Over the years, esp after I got married to the vegetarian family, this remained as a forgotten dish as amma made almost all dishes with fish and chicken. Brother and me no longer craved for irachi ularthu. So what made me go back and try it all over? 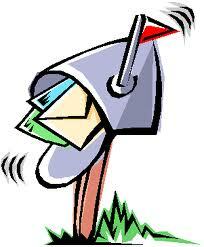 Yes, blogging! Elaborating traditional recipes makes me crazily content and this is an attempt of a recreation that proved extremely satisfying. I have used mutton for the main and step wise pictures here. Wash meat well in running water. Drain. Marinate using the above ingredients listed under, 'to marinate'. Let it stand for at least an hour. 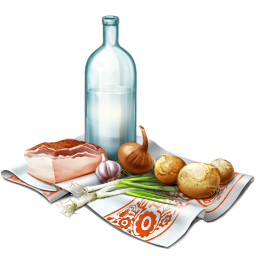 Transfer meat to a pressure cooker ( 3 ltr would be fine for the above amout) Do not add more than 1/4 cup of water (for 1/2 kg meat). The meat lets out water so we do not need too much of it while cooking. Good quality meat gets cooked within 3-4 whistles. 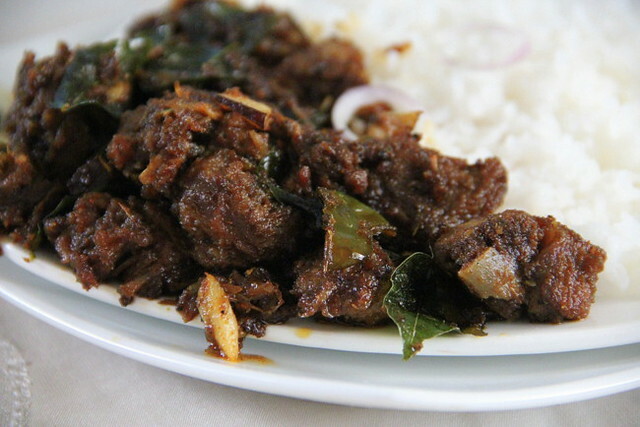 The meat in Kerala cooks a bit slower. So give extra 'whistles' accordingly. Let the steam vent out by itself. Open the lid. You may see the water has oozed out. and curry leaves (2 sprigs). 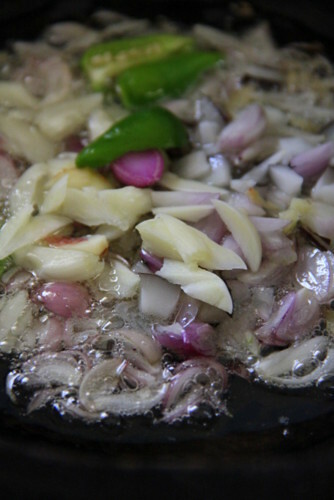 Saute until the coconut bits and ginger-garlic are toasted and the onions acquire a golden colour. They would get caramelised further as you fry the meat later. Dump the meat along with its gravy. Lower heat to medium and reduce the water under controlled heat. Now you see the cooked water has turned saucy. The gravy thickens and the masala gets coated within 3-5 minutes. Be careful with the flame at this point. drizzle a little more oil as you are going to fry the meat further. Check salt and add the remaining 1/2 tsp pepper powder( we had used 1/2 tsp earlier and had reserved the rest half to add at this point). Tip in 1/2 tsp of garam masala for more flavour. The masala may stick to the bottom. So turn the meat pieces once every minute. Roast until it gets dry and acquires that dark brown hue. I personally don't like them too dry and hence take off from fire while the pieces get coated well with the masala and are still moist and succulent. 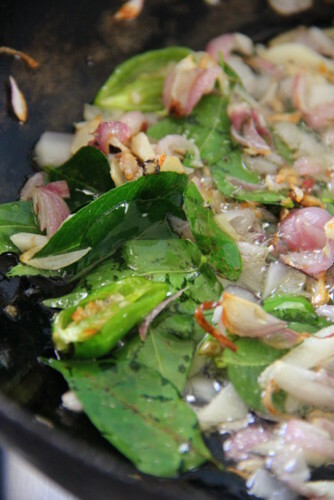 -> Addition of coconut oil is a must for the dish. -> Addition of ginger garlic paste in marination is fine but use julienned ginger and garlic for seasoning. -> Coconut bits / thengakothu are a must too. -> I used store bought garam masala. So I have used fennel seeds for an extra flavour as this is the dominant spice of the dish. 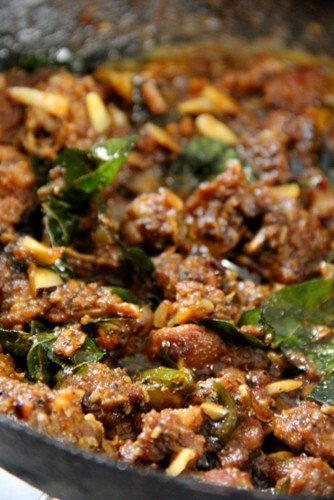 ->Home Made Garam Masala goes a long way and adds the special touch to the dish. You can dry roast and grind the following ingredients to make Fresh Garam Masala Powder. This picture right above is an exception. 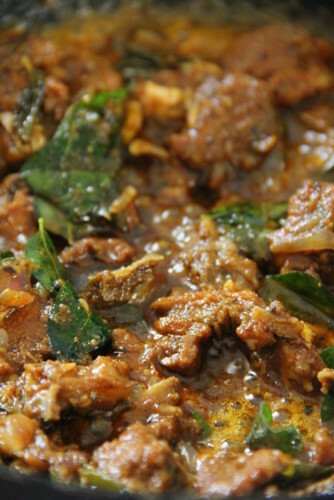 Yes, this is 'Beef Ularthiyathu' made as a trial, much prior to the above the post. It was undoubtedly a 'perfect dish in first attempt' one! 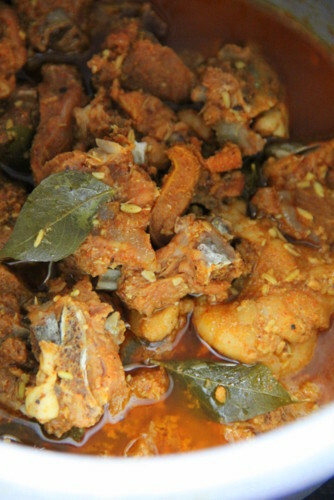 The Central Keralites have pet named the dish as follows..
'Erachi Ularthiyathu' stays well in fridge for more than a week. Keeps better if frozen. 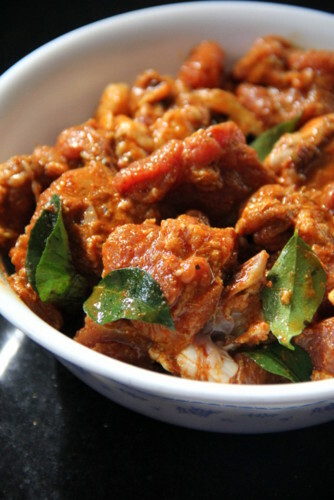 The dish tastes the best next day as the spices seep better into the meat pieces. Drier 'ularthu' has a long shelf life of more than a month, if frozen. Thaw to re-use. This post is dedicated to my school and college budddies; Jaivy, Anitha, Merlin, Ansu and Sara who shared the best of their lunch box meat fries with me. We miss, miss and miss those lovely days! Love love this, mom used to make it on sundays and w eloved it.We used to go to the kitchen and take (steel) pieces of meat and the coconut. I do make here rarley when i have guest but i don't make it so dry like back home ( even though i prefer the really dry version) here they don't. Now i am absloutley drooling. Oh my god. I am so craving this right now although it's been many years since I've eaten beef. I think I'll try a chicken version one of these days! 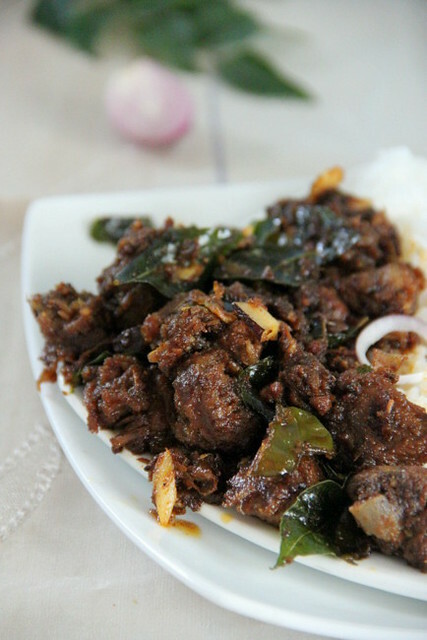 Delicious and tempting kerala meat. That looks spicy good! I love it with plain rice. Yum! 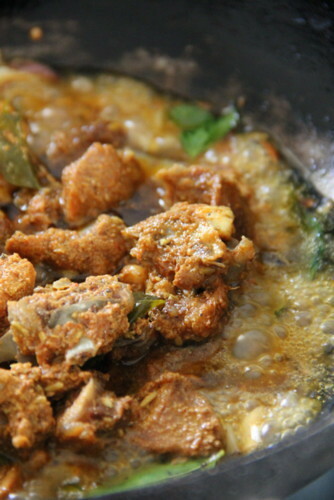 Lipsmacking mutton fry, am getting hungry just on looking at the picture,irresistible. Very attractive meat fry and I'm sure the flavour matches the colour. 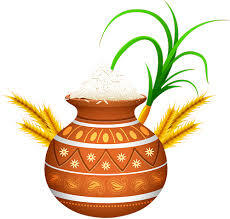 The traditional Pongal celebration is brilliant like a magazine article. Happy Pongal! 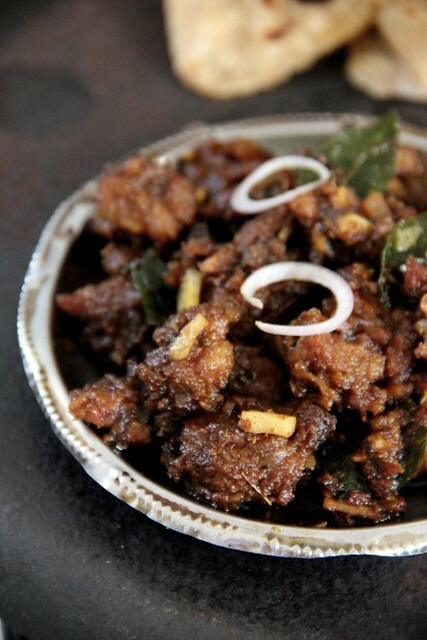 Bharathy, Happy Pongal and just a quick question about this recipe. I prefer not to make any red-meat for my hubby and daughter. So, can I adapt this recipe for chicken breast pieces or is it particular to red-meat? Hope you enjoy the pongal holidays with your lovely family. Thanks for the recipe. When you say central Kerala, do you mean Kottayam? did u fried the meat at low temperature? and whats the temperature for pressure cockering ? 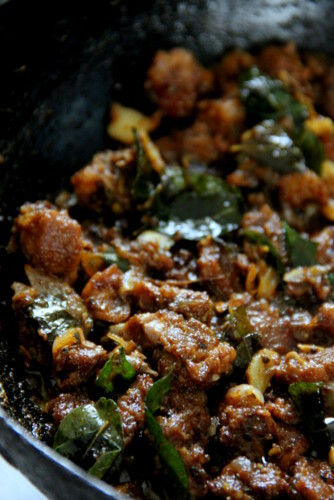 That looks yum : p Could u pls advise on the changes to b made to the quantity of ingredients for 1 kg mutton? I very badly want to try out this recipe.plssss advise!